This article was previously published in the IMF Blog - Insights and analysis on Economics and Finance, on January 31, 2019. Progress in achieving the sustainable development goals (SDGs) hinges on countries’ ability to scale up spending in important areas like health, education and infrastructure. A new IMF staff study shows that the required scale-up varies widely across countries. For emerging market economies, the average additional annual spending required in 2030 to reach key SDGs stands at 4 percentage points of GDP, compared to 15 percentage points of GDP for the average low-income developing country. Given that many developing countries still collect very little tax revenue, building tax capacity is the first line of action. Increasing the tax-to-GDP ratio by 5 percentage points of GDP in the next decade is an ambitious but reasonable target in many countries. For most emerging market economies, this additional tax revenue would be sufficient to finance the increase in spending. This will require strong administrative and policy reforms, where the IMF and other development partners can play a key supporting role. 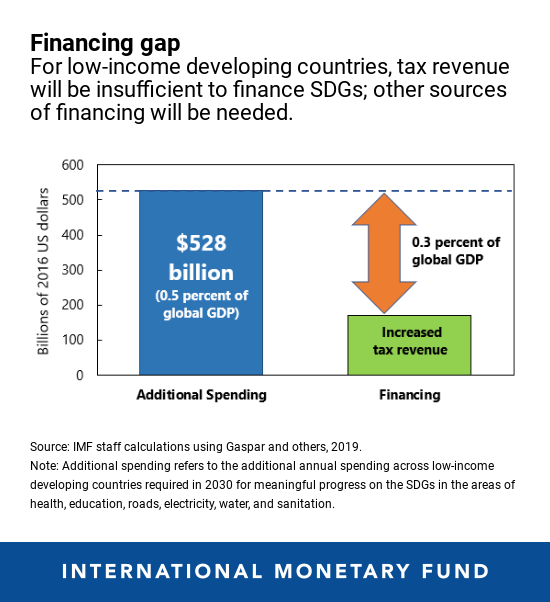 In our Chart of the Week we show that for low-income countries (with combined needs amounting to half a trillion, or 0.5 percent of global GDP), the extra tax revenues—if successfully realized—could finance one-third of the total additional needs resulting in a gap of 0.3 percent of global GDP. More is needed. Closing the gap will also crucially depend on increasing the efficiency of public spending which can result in significant savings and ensure spending is redirected to areas where it is most needed and where it will result in the biggest bang for the buck. To ensure countries not only spend more but do so efficiently, they must develop political and societal consensus, work on building strong and effective public institutions, and instill principles like transparency, accountability, and responsiveness throughout both the public and private sectors. This requires a variety of global public goods including geopolitical stability, open trade, and climate initiatives, as well as addressing corruption by tackling both supply and demand elements. While low-income developing countries must own the responsibility for achieving the SDGs, the private sector, official development assistance, philanthropists, and international financing institutions can help accelerate the efforts to close the remaining gap. It is time for joint action by all stakeholders.